Here is a true one of kind collectors item! 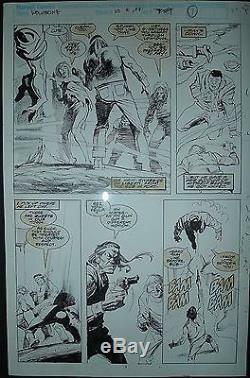 John Buscema & Bill Sienkiewicz' Wolverine #10 page #7. This is framed along with a copy of #10 CGC 9.8, white pages! This was professionally framed using acid free papers and U/V protected glass. 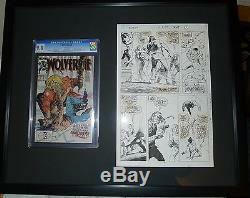 The art and the comic have been mounted using special adhesives that will not affect the art or the CGC case. They were mounted because nothing is matted down. The full art page with it's defects are present and it gives it a better "feel". 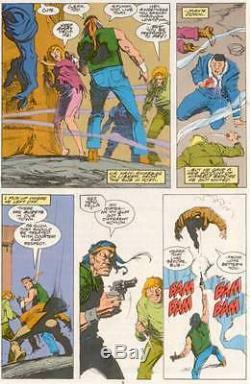 The art was pencilled by John Buscema and inked by Bill Sienkiewicz! I fully stand by my items! I've been dealing with comics for 30 years now but I would not presume to be an expert. If you have specific questions, let me know but the scans should answer most questions. If the interior has missing pages or cutouts, loose center folds etc... The item "Wolverine #10 Page 7 Buscema & Sienkiewicz original art with a CGC 9.8 framed" is in sale since Monday, January 16, 2017. This item is in the category "Collectibles\Comics\Original Comic Art\Interior Pages". The seller is "mulder5522" and is located in Gatineau, Quebec. This item can be shipped worldwide.